It was only a matter of time before I dusted off my old dice bag, poured out my set of multi-sided dice, and actually talked about a different venue of gaming – tabletop gaming. Tabletop gaming has been a part of my life for quite some time, but only recently have I come to admire and appreciate what tabletop gaming has done for me as a grown man. I recently found some wonderful videos that details how Dungeons and Dragons can make you a more confident person. I felt like I should share them with my readers, because I feel like tabletop gaming can share so many benefits that video games just don’t provide a player. “Seriously? How does rolling dice do all of this for me? – as if it was some exclusive club we were officially shunning folks from. In actuality it’s a pretty open format available to pretty much anyone who’s willing to open their evenings up to an evening filled with goblins, gnomes, and epic adventure stories that seem to be pulled straight from the pages of The Hobbit. The great thing about tabletop gaming is that, now, there are so many variations and styles of tabletop game – you’re kind of hard pressed to find something that you won’t like. Whether it’s the new-school Pathfinder, or the old-school DnD 1st Edition – you’ll find something to wet your creative imagination. 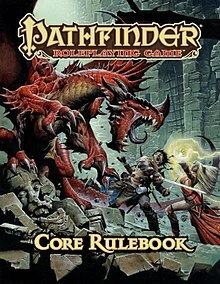 I started playing DnD – or variations of it – about 8 years ago. I got hooked on video games like Neverwinter Nights, Baldur’s Gate, and other RPG games. The one aspect I found most fascinating was the concept that I could play as anyone, or anything I wanted – within reason – and I could journey on these exquisite quests with lavish adventures with other characters that had lavish personalities. It was like a small oasis of sanity in a time in my life where I felt quite misunderstood and uncomfortable with who I was as a person. Tabletop games are fun for your soul. I know that sounds fleeting, but hear me out. In comparison to online FPS’s, RPG’s, etc. You are in a room with your fellow friends [ If they aren’t your friends, well then I hope they become them. ] so you’re already gaining social interaction. You’re gaining SELF-CONFIDENCE due to an increased feeling of endorphins from succeeding in a roll check or doing some epic feat in front of the entire party. You’re gaining REAL WORLD PROBLEM SKILLS as you search to find a way to defeat a band of rogues on a road – together – and now you’re learning COLLABORATION. Roleplaying games provide social and individual acceptance. Embrace it. Love it. Learn it. Go Play it. A Campaign can be ANYTHING you want. Imaginations are only limited by the person, not the rules. You’ll learn to love who you are as you roll along. Now get out there and roll some d20’s!